The Powerspread Dairy is the general purpose side discharge farm spreader that will spread all types of slurry and straw yard dung. It has a fixed main auger speed of 13 rpm at 540 PTO speed which makes for fast and efficient spreading. The overshot impeller spins at 700 rpm giving a fine fragmentation to the dung and an even and accurate spread of up to 18 metres width. The patented centrally opening door is fed from both ends of the spreader body by means of a contra rotating auger which reduces internal stress in the spreader body and provides a boiling action to further break down the dung inside prior to being spread by the impeller. The door opens vertically allowing use of the full width of the impeller even when applying a very fine amount of slurry or dung. The range comprises of the general purpose farm spreader the Powerspread Dairy which will spread all types of slurry and straw yard dung and the Powerspread Pro which is aimed at the large mixed farm and professional user and will spread all types of waste including poultry litter, compost and dry industrial wastes with ease The 2400 and 3200 gallon machines are capable of spreading any solid or liquid and have higher discharge rates due to their wider door/discharge rotor arrangement.Common design features to all models is the tapered tub design and unique contra rotating auger that pulls dung from both the front and rear of the spreader to the patented centrally opening door. This produces a ‘boiling’ action inside the spreader when applying a fine coating of manure and reduces the stresses on the body of the spreader. 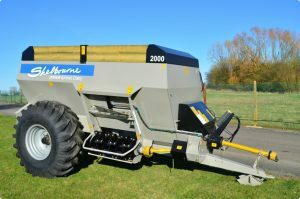 The door of the Powerspread is vertically lifting thus allowing the full width of the impeller to be used at all times, the impeller itself is overshot in design, or spinning upwards, at 700rpm which makes for a very fine fragmentation, which is essential for grassland work, and gives spread widths in excess of 20 metres.